Turkish President Recep Tayyip Erdogan and his Russian counterpart Vladimir Putin warned that the US move on Jerusalem destabilizes the Middle East and will not help resolve the Israeli-Palestinian conflict.Speaking at a joint news conference on Monday after his meeting with Putin, Erdogan criticised Israel for taking advantage of the US move on Jerusalem as "an opportunity to ramp up oppression and violence against the Palestinians," Xinhua reported. "It is impossible for anyone who has a conscience, morality, or value to ignore the killings," the Turkish leader said.He was apparently referring to the deaths of two Palestinians who were killed by Israeli forces in clashes over the weekend in the Palestinian territories during Palestinian protests against Israeli occupation and US President Donald Trump's decision last week to recognize Jerusalem as Israel's capital.Erdogan added that Turkey and Russia share the same position on the US decision to recognise Jerusalem as Israel's capital, and will keep close cooperation on the issue. "We have seen the same approach on the US Jerusalem move. Both have agreed to continue our contacts in this regard," he said.For his part, Putin said the US decision to recognize Jerusalem as the Israeli capital did nothing to help solve the Israeli-Palestinian conflict, and was destabilising the situation in the Middle East. 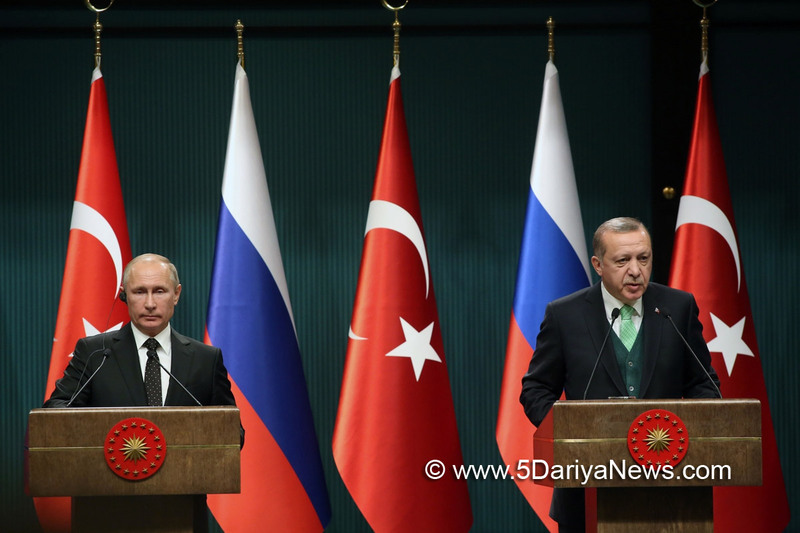 "The status of Jerusalem should be resolved by direct contacts between Israel and Palestine," Putin said.Erdogan said that, as the chairman of the Organization of Islamic Cooperation (OIC), Turkey had invited the Islamic leaders to hold a summit in Istanbul this week. "I believe we will deliver a very strong message from there," he noted.Both leaders also discussed the bilateral relations as well as regional developments, particularly Syria, while pledging to continue cooperation on the Astana political process to resolve the Syrian crisis.They planned to hold a meeting next week in the Russian resort of Sochi, according to Erdogan.The two leaders have been meeting regularly in the past months. They last met in Sochi on November 22 to discuss the issue of Syria with Iran.